Applications are pretty useless if they can’t communicate with each other. The way they do that is through Application Programming Interfaces (APIs). API testing touches your entire application – it’s so much more than simply sending a few calls back and forth. 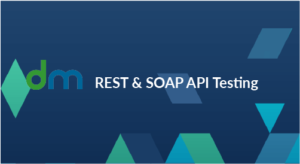 What’s REST and SOAP and what do they have to do with APIs? APIs do pretty much everything in the background. Think of them as clerks running around an office, picking up and delivering messages. When a customer logs into their account, adds items to their shopping cart, and checks out, that’s all handled by APIs. REST stands for Representational State Transfer. It’s an architectural style for building APIs that has become increasingly popular. It relies on existing protocols like HTTP. SOAP, or Simple Object Access Protocol is a standard protocol that’s used to create APIs. So how do we test REST and SOAP APIs? Thoroughly. APIs are critical to your website and applications, so you can’t skimp on testing them. It starts with the test plan. Way back in the design phase, you should have identified who your end users are and what they’re using your APIs for. The use cases and scenarios in your design documentation should tell you everything you need to know here. Functional testing to ensure that the new APIs function as expected. Integration testing and Regression testing. This means testing your entire website or application to make sure that the new APIs haven’t broken any existing functionality. Assume nothing here – seemingly unrelated APIs can be affected by the new ones. UI testing to make sure that the APIs are interacting with the user interface correctly. Load testing to see if the new APIs can handle the expected traffic. All REST and SOAP API testing should include GET and POST requests. How can I automate REST and SOAP API testing? There are several solutions available to you here. Dotcom-Monitor’s SaaS solution for API testing is called LoadView API. LoadView offers full load testing and stress testing functionality, so you may find yourself using it for more than just API testing. LoadView API can thoroughly test REST and SOAP APIs. It checks the expected results vs. the actual results of the APIs, which covers Functional, Integration, Regression, and UI testing. It shows you individual test sessions so you can see any error codes that were returned. LoadView API also offers troubleshooting tools to help you track down the source of the issues. Where LoadView API really shines is (unsurprisingly) in load testing REST and SOAP APIs. It lets you simulate thousands of users hitting your APIs from a variety of locations. LoadView API utilizes cloud servers all over the world, so that you can test your APIs against traffic from your target markets. This realistic testing can ensure that your APIs will respond effectively once they go live. Do I really need to load test my REST and SOAP APIs? Only if you want your website or application to keep working when you move the new APIs into production. Remember – it doesn’t work unless it can work under real world conditions.